Anyone who has seen the best-selling Channel 7 football highlights package “Sensational Seventies” will be familiar with Denis Collins as the Carlton player involved in a famous confrontation with St Kilda’s Robbie "Mad Dog" Muir, late in the last game of the 1978 season at Moorabbin. Victory in that important match against the Saints would have given Carlton a berth in the Qualifying final rather than the Elimination final, but that was not to be, as we went down by 40 points. The only drawback on a day of joy for Saints supporters was Muir’s last quarter report, for striking his former team-mate Val Perovic. As usual, Muir was furious when he was booked, and after flinging his mouthguard away, he began abusing the umpire. Meanwhile, Collins bravely - but unwisely - decided to rub it in. He came up beside Muir right in front of the infamous Animal Enclosure (packed with St Kilda’s most vocal supporters) and ruffled the volatile Saint’s hair. Instantly, Muir exploded – flinging back a left forearm that hit Denis flush on the jaw and knocked him flat on his back. As the umpires rushed in to book him again, the final siren sounded. Muir was hustled off the field by a couple of trainers, but not before he had also lashed out at a young spectator who got too close! Collins had joined Carlton earlier that same year from Footscray. A bushy-bearded winger/half forward whose key asset was his pace, he had played exactly 100 games and kicked 60 goals for the Bulldogs over six seasons, before looking for a fresh start elsewhere. At Princes Park, he was honoured with our number 1 guernsey for his debut match, which came against Melbourne at Princes Park in round three. Playing on a wing, he was solidly effective in a 13-point win, and held his position in the senior team right through the season. The week after his clash with Robbie Muir, Collins lined up for only his second career final when Carlton met Geelong in the Elimination Final at the MCG. His experience, and his speed in the open spaces on the wing, proved valuable in helping the Blues to an emphatic win by 33 points. In the following week’s Semi Final clash with Collingwood, a tough, fiery encounter was indispersed with some brilliant passages of play from both sides. Collingwood jumped away to an early good lead and although the Blues fought back to within four points at the last break, the Pies weathered the storm and ran out 15-point winners. Denis Collins was the Blues top vote scorer in the 1978 Brownlow with 12 votes. After a solid pre-season, Collins played the first seven matches of 1979 in succession, only to then be sent back to the Reserves while Carlton’s match committee took a close look at one of that year’s promising recruits; a red-haired terrier from South Bendigo named Peter Francis. However, being relegated at that particular time did not sit well with Collins. Although he was reinstated for rounds 11 and 12, he fell out of favour with his captain-coach Alex Jesaulenko after that, and spent the remainder of the year with the seconds. While the Navy Blues went about claiming their twelfth Premiership with a controversial Grand Final triumph over Collingwood, Collins requested a clearance to Sydney club North Shore, but it was refused. Eventually, Collins returned to training with the Blues as the 1980 pre-season got underway, although it was already obvious by then that his days at Princes Park were numbered. In March of that year, he was cleared to Richmond, where he knuckled down, and rounded off his 147-game VFL career with another 17 appearances in his only season for the Tigers. In later years, Denis and his wife Sheenagh settled at Hyden, in country Western Australia. There, on Wednesday, August 30, 2011, he suffered a massive heart attack, and passed away at the tragically young age of 58. That Collins’ old team should meet St Kilda in the final round of the home and away season this Saturday night is somewhat ironic, for it was in the final round match of 1978 between the two teams that Collins found himself face-up on the Moorabbin turf following a confrontation with the Saints’ volatile footballer Robert “Mad Dog”Muir. That clip found its way to the Seven Network’s well-worn “Sensational Seventies” package and still gets a run from time to time. Following the tete a tete with Muir, Collins took to the field for what was only his second career final when Carlton met Geelong in an eliminator at VFL Park, and he contributed significantly to the team’s 33-point triumph. 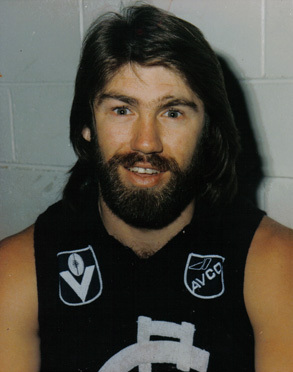 At the conclusion of his time at Carlton, in what was a premiership season under Jesaulenko, Collins pursued his career with Richmond. There he managed a further 17 matches, and was named as an emergency for the 1980 Grand Final. In the early 1980s, after a brief run with WAFL club East Perth, Collins made his way to Hyden, about 330 kilometres east of Perth in the Western Australian wheatbelt. He chased the leather for the local football club and together with his future wife Sheenagh managed the local Wave Rock Hotel Motel near the famous geological formation. It was at Hyden that Carlton Assistant Coach Mark Riley forged a friendship with the Collins’s, who became godparents to his daughter. “I’d never been outside the city and they sent me out there with teaching, and they really looked after me. He and I became great mates,” Riley said. “He was a very giving person, very community-driven and incredibly generous . . . any profits that he and Sheenagh made were pumped back into the town, and If you can imagine where he lived - this tiny little town in the middle of an arid wheatbelt where it rains once every ten years and suffers drought the other nine. “I remember seeing him at a recent Spirit of Carlton day. I left him at the bar with ‘Sellers’ (Mark Maclure), Jimmy Buckley and those sort of blokes, and it would have been the first time in 20 or 30 years that he’d had the chance to catch up with them because he’d put so much time and energy into his work.” Maclure, Carlton’s 243-game triple premiership player who last saw Collins in Port Douglas, remembered his old teammate as tearaway footballer who’d fared well against the Blues in earlier contests. “They got him from Footscray because he was speedy and quick, and he always gave us a lot of trouble when we played them,” Maclure said. “I’m not quite sure why he missed out in ’79, but he fitted into the club quite well. He was a very affable sort of bloke and quite a nice guy.” A family friend Bernie Mouritz, said from Perth yesterday that the entire Hyden community was shocked and deeply saddened with the loss of one of its own. “Denis was here in Perth only ten days ago having a kick of the footy with my young bloke,” Mouritz said. “I spoke to him again the other day, he’d been to the doctor about his high blood pressure, but he’d had tests and was on medication and everybody thought ‘Okay, he’s got it under control’”. He was feeling good about life and was looking forward to the coming season .It was all coming together, then this. We are all gutted." Mouritz said that Collins complained to his wife early yesterday that he was feeling unwell and promptly checked himself in to the local Silver Chain Medical Centre. The flying doctor was called, arrived and every care was available and taken. But Collins suffered a massive heart attack while being stabilized and could not be revived. “Denis was a good man, he was community-spirited and didn’t ever ask you to do anything he wasn’t able to do himself on or off the footy or cricket field. Anybody who has a hard word to say about him is probably jealous because he could actually do it,” Mouritz said. “He leaves a massive void, a huge hole in the community. Ironically he’d just helped raise funds for the Royal Flying Doctor Service. He built the infrastructure and had automated the lighting system at The Hyden airstrip so that the flying doctor could arrive at any time at all. Collins is survived by his loving wife Sheenagh and the many friends he had made over his time in Hyden. - Tony De Bolfo. Contributors to this page: Bombasheldon , Grisdesa , molsey , Jarusa , PatsFitztrick , tmd1 , dgreen2 , WillowBlue , true_blue24 , Mav and admin . Page last modified on Sunday 16 of September, 2018 17:01:14 AEST by Bombasheldon. 1995 GF - Dean & Brown celebrate win. 1993 Rd 17 - Tim Powell & Tim Watson.